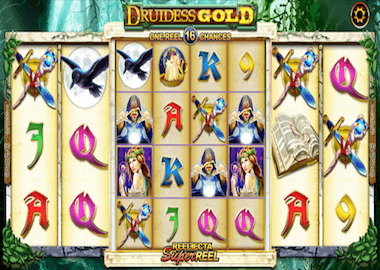 The Druides Gold Slot is an eight reels slot with three or four rows and 1296 ways to win. It comes from Australian software developer Lightning Box Games. The slot has an outer area with three rows on the reel and in the middle is the 4×4 reflecta reel. You do not have to worry about paylines, because as long as identical symbols end up side by side on your reels, payouts are generated. The focus is the Free Spins feature with locked wilds and the chance for a mega spin. From a bet of 50p you can bet the real spins and the maximum is £ 500. The Druides Gold is also compatible on all devices including Smart Phones. Symbols and Payouts: Lightning Box Games has given the Druides Gold Slot low paying playing card symbols and theme related symbols. The poker cards are 9, J, Q, K and A. However, there are no 10 for any reason. These symbols will pay a maximum of 40x your bet for 5 identical symbols side by side. The theme related symbols include candle, a crossed sword, a spell book, a raven and a druid. The highest payout is for the druid symbols which pays 250x your bet. There is also a Wild Symbol (the Elven Woman) which replaces all other symbols except the Bonus Scatter. Reelfecta Reel: The Reelfecta Reel is a special feature on the Druides Gold Slot and you have to get used to it. Basically, you play here with 2 slots at the same time, but they are connected. After a couple of spins, you know how it works! Especially during the base game it gives you extra chance to form winning combos with any of those 16 symbols. If you get free spins, you also have the opportunity to land a mega spins. The Reelfecta Reel is, so to speak, a constant reel bonus to increase your chances of winning. It definitely guarantees you even better entertainment. Free Spins feature: The Free Spins feature is called the Ring of Protection Bonus. To trigger the Free Spins feature, you need at least 5 green Bonus Scatter symbols. These only land on the outer ring of the reelfecta symbol. With the Free Spins you also get an instant price of up to 500x your bet for 10 scatter symbols. You then play up to 12 free spins with locked wilds that only land on your extra reel. These only land on the outer ring of the Reefecta reel. If you manage to collect all 10 wild symbols, you will get a mega spin with a massive win! Lightning Box Games has developed an extraordinary slot with the Druides Gold slot. Just like the Mild Rockers Slot or the Chilli Gold Slot, there are new features you will not find on every slot. You can test the Druides Gold Slot here for free (click on the banner above). Then you can familiarize yourself with the Reelfecta Reel. Find more info and free slots from Lightning Boxes here. You can find online casinos with slots from Lightning Box Games in the table below. The Miami Dice, O’Reels Casino or the Spin Rider Casino are top addresses with huge bonus offers and free spins.